African dwarf frogs are very easy and inexpensive animals to keep. Compared to other exotic pets, our frogs' needs are few and simple. The things that they need, however, they really need. Their essentials may be few, but they'll die without them. I hope that most people who read this site will not have purchased their frogs yet. They'll therefore have the luxury of being able to take their time properly preparing their new pets' habitat before they bring their frogs home. That's really the best way to go about getting a pet. Because I'm a realist, though, I'm also going to assume that a few of you will already have purchased your frogs, and that you'll need to set up a tank for them in a hurry. ADFs are notoriously popular impulse purchases. They're cute, funny, and inexpensive exotic pets, so a lot of people buy them without having made the proper preparations. With these two assumptions in mind, I'm going to divide this page into three sections. I'll start with the absolute essentials, move on to items that are very important but not strictly necessary, and end with items that are nice to have, but not very important. As mentioned, ADFs require very little, but some things are musts. Here are the items that should be considered absolute essentials if you want to get into the African dwarf frog hobby. 1. A tank that's big enough, but not too big. Setting up an African dwarf frog tank starts with the aquarium tank itself. Not just any tank will do. You need to keep the unique needs of ADFs in mind when selecting a tank for their habitat. ADFs are very unusual animals. They spend their entire lives underwater, but as adults they have lungs and need to breathe air. (ADF tadpoles have external gills, but they lose them and develop lungs when they grow up.) African dwarf frogs also like to spend most of their time on the bottom of whatever body of water they live in (including their tank when in captivity), but they have to surface frequently to breathe. Another thing to remember is that even though they spend their whole lives in the water, African dwarf frogs are not strong swimmers. Coming up to breathe from a depth of more than about 12 inches (roughly 30 centimeters) can be quite a challenge for them. So when selecting a tank, the height is critical. I wouldn't use a tank much higher than about 11 or 12 inches (28 to 30 cm) for ADFs. The tank can be as wide as you like. It just can't be too high. Your frogs will drown and die if they can't surface to breathe. As far as the tank's water capacity is concerned, one gallon (3.8 liters) of water per frog is the minimum that you'll need to keep your African dwarf frogs healthy and happy. If you overcrowd the tank, it will be much more difficult to maintain good water quality. Overcrowding will also increase the frogs' stress level to the point that it becomes harmful to them. Most beginners use 10-gallon (38-liter) tanks for ADFs. That's not a bad choice. The tank in this site's video feed is a 10-gallon. A 10-gallon tank is large enough to house a small community of frogs, low enough in height that they won't have a hard time coming up for air, and small enough to fit in most homes. Ten-gallon tanks and accessories are also pretty inexpensive as aquarium supplies go. You'll also need an aquarium stand, a sturdy table, or some other sturdy piece of furniture to set your tank on. You can also use a 20-gallon or 20-long tank (but not a 20-High or 20 Extra-High), especially if you're using a substrate on the bottom. It's the distance from the substrate to the surface that matters, not the height of the tank itself. Using a larger tank will make it easier to maintain the water quality. The higher the water amount per-frog, the easier it will be to maintain water quality. Other oddball tank sizes are also okay as long as the water-per-frog ratio is at least one gallon and the tank isn't too high. But it will be harder to find accessories like lids and stands for non-standard tank sizes. If you're setting up a new tank, sticking with standard sizes will make your life easier in the long run. 2. A tank cover with no openings. An aquarium cover is a must for an African dwarf frog habitat because they are frogs, after all, and they do like to jump. In nature this isn't a problem because if they jump out of the water, they just fall back back into the water. But if they jump out of your tank and land anywhere except the water, they will die. African dwarf frogs are fully aquatic, which means that they must live in water. If they're out of the water for more than 15 or 20 minutes, they will dehydrate and die. Many aquarium covers have opening for filters, air lines, and wires that are big enough for our frogs to jump right through. Some come with covers for unused holes, but others don't. If the one you buy has openings, but no covers for them, then you'll have to make covers yourself. The picture on the right shows the covers I made for the holes in the tank cover that I'm using for the frog tank in this site's video feed. 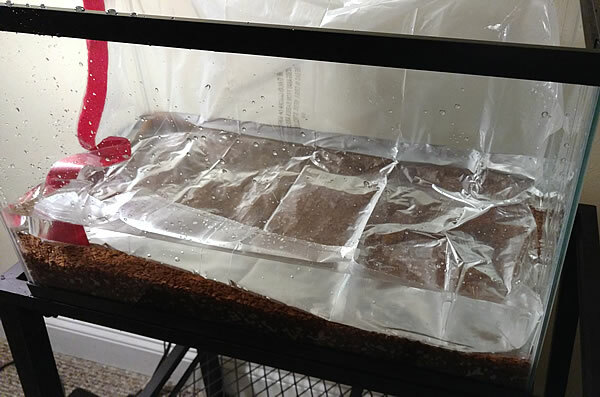 I made the covers out of polyethylene closed-cell foam that I always save when it's used for padding in packages that I receive, and some scraps of light diffuser material that I had left over from an above-tanking basking platform that I made for one of my turtle habitats. My homemade covers aren't the prettiest things in the world; but they fit snugly, help reduce evaporation, and most importantly, keep the frogs in the tank. The closed-cell polyethylene is easy to cut to custom-fit any opening, and it doesn't crumble like Styrofoam does. I use it for a lot of aquatic habitat projects. If polyethylene foam and light diffuser scraps don't quite complement your decor, then you do have some other options. The easiest one would be to simply buy an aquarium hood that comes with covers. They're out there. You just have to look for them. You also can buy a glass aquarium cover if you want something fancier. 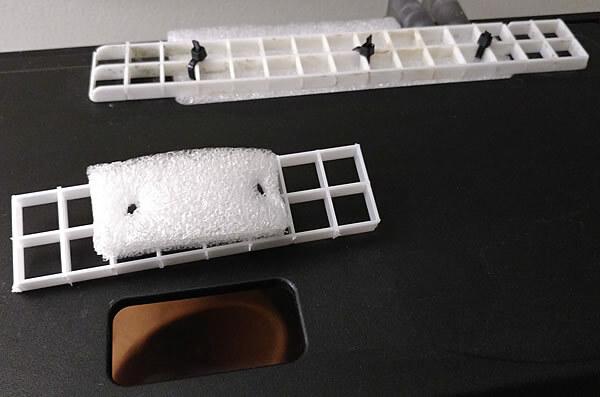 Most of them have some sort of plastic on the rear side that can be cut to allow tubing and such through into the tank, so the only holes in it will be the ones that you make. If you're careful, you can cut the openings that you need so that there's no extra space for the frogs to jump through. Combined with an LED aquarium light that fits over the top of the tank, glass tank covers can also be very attractive. Another option is to use a screen-type tank cover like the ones we use to cover reptile tanks. The disadvantage (aside from their being kind of ugly) is that the water will evaporate more quickly. They also tend to rust over time. African dwarf frogs are prey animals, which means that in nature, they'll get eaten if they're not careful about hiding themselves. Knowing how to hide and having places to do it are matters of life and death for African dwarf frogs in the wild, and that need remains part of their behavior even when they live in a fish tank where there are no other animals looking to eat them. If you don't give your ADFs someplace to hide, they'll be so stressed-out that they may actually die from anxiety. The need hiding places. It doesn't matter if the hiding spaces are fancy or not. The frogs don't care about that. They just need hiding places so they feel secure. Many aquarium decorations make excellent hiding places for ADFs, but I just used an unpainted clay flowerpot for this habitat. It cost less than a dollar at my local hardware store. The frogs like it just fine. Just don't use painted or glazed pottery. Some pottery finishes can leach out into the water and poison the creatures living in the tank. If you want something a bit fancier and more natural-looking, consider the LUFFY Natural Coco Hut. It's a perfect size and design for an African dwarf frog hiding place. Live plants or soft, silk artificial plants are also good hiding places for African dwarf frogs. 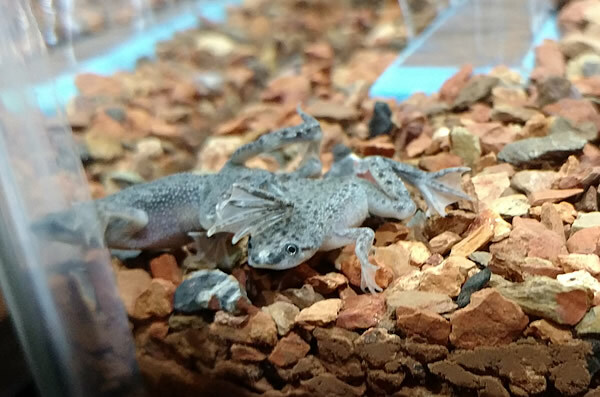 African dwarf frogs need regular periods of light and dark to maintain their circadian rhythms, but you don't need expensive UVB or basking lights like the ones reptiles need. Pretty much any standard aquarium light will do. I use LED aquarium lights because they last pretty much forever (I've never had to replace one) and they use almost no electricity. You may want to use plant lights, however, if you have live plants in the tank. Most "beginner" aquarium plants do well enough on LED light that you don't need special lighting, but some exotic (and expensive) aquarium plants do need special lights. If you consider the plants and aquascaping to be part of your hobby, then you'll probably want to use plant lights. In my case, the plants are in there mainly to help keep the water clean and to give the frogs hiding places, so I don't bother with special plant lights. An aquarium heater is almost always necessary. The exception would be if you always keep the room where the frog tank is located at a temperature of about 80 F (26.7 C) or higher. The frogs need a water temperature of no less than 75 F (23.9 C), and they prefer closer to 78 F (25.6 C). In order to maintain those water temperatures based on room temperature, you'd need to keep the room at about 80 F (26.7 C) or warmer, which almost no one does. Unless you're one of those rare exceptions, you need an aquarium heater for your African dwarf frog habitat. Most aquarium heaters are submersible, which means they're installed inside the tank, in the water. These type of heaters must remain fully submerged in the water or else they will burn out. There are also in-line external heaters that attach to the outflow side of a canister filter or an aquarium pump, outside of the tank, and heat the water as it passes through. They're good if you want to free up space inside the tank or if it's heavily planted. Dense plantings reduce the efficiency of submersible heaters by interfering with water circulation inside the tank. Unless you plan on doing water changes every single day, you'll need either a freshwater aquarium water test kit or aquarium water test strips. Many of the toxins in aquarium water are not visible to the human eye nor smellable by the human nose until they have reached levels that are toxic to our frogs. Without some way to test the water chemistry, you'll have to do partial water changes every day. The water won't necessarily need to be changed every day, but you'll have no way of knowing whether or not it needs to be changed without a test kit or test strips. Aquarium water test kits produce more accurate results and are less-expensive than test strips in the long run. Test strips, on the other hand, are easier to use and provide readings that are accurate enough for all practical purposes. If you already have your frogs and you need to get your tank set up today, then you're going to need at least one, and maybe two startup additives to jump-start the cycling process and remove harmful chlorine and chloramine from the water if your tap water contains them. If you're using well water or spring water that you know for a fact has no chlorine or chloramines in it, then all you need for a rushed tank setup is a starter bacteria additive. My personal favorite for small aquatic habitats is Tetra SafeStart. API Quick Start is also very good. If you also have to remove chlorine or chloramine, then you'll also need to use a dechlorinator like Tetra AquaSafe PLUS Water Treatment, API Tap Water Conditioner, or Seachem Prime. Unless your water comes from your own well or spring, then it almost certainly contains chlorine and possibly contains chloramine. Chlorine will evaporate in about 48 hours if you do nothing to the tank other than let it sit, but chloramine will not. If in doubt, use a dechlorinator. Please note that using any of these products to rush the cycling process doesn't immediately make the water perfect. Very few (if any) startup additives contain the Nitrospira bacteria that do the heavy work or converting the nitrites to nitrates. Most startup additives do contain Nitrobacter bacteria, which also do that work, but not as efficiently as Nitrospira do. Building a healthy colony of Nitrospira will still take time and can't be rushed. Using a starter additive will, however, lessen the ammonia, nitrite, and nitrate spikes while the tank and filter are cycling and the Nitrospira colony is growing. It's important to test the water chemistry frequently during this process. 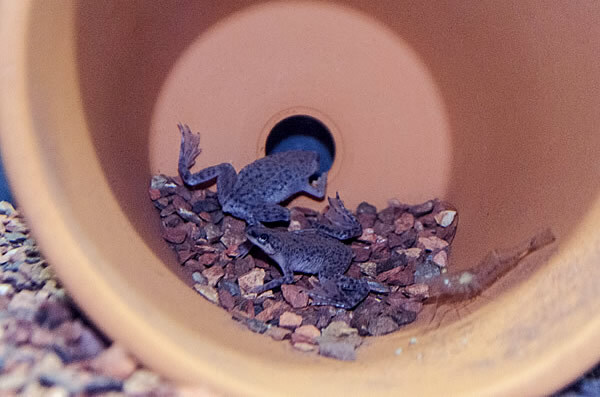 These items are very desirable things to have when keeping African dwarf frogs, but they're not absolutely necessary. Aquarium filters don't just filter particles out of the water. The filter in a properly-cycled aquatic habitat is where the friendly bacteria colonies live. They tirelessly work to digest the waste the creatures in your tank produce and convert it to less-toxic compounds. This process is called biological filtration, and it's the most important thing that the filter does. If you don't use a filter, then you will be doing water changes much more often because there will be little or no biological filtration happening, and the ammonia and nitrite levels will rise very quickly. If you do use a filter, on the other hand, the need for water changes will be much less frequent once your tank has cycled. You'll mainly need to do water changes when the nitrate levels get too high. The friendly bacteria in the filter take care of the ammonia and nitrites in a well-cycled tank. I talk more about frog tank filtration here. But just in case you're ready to run out to the pet store and buy a filter right now, I do want to mention that I'm a strong believer in external canister filters for African dwarf frog habitats. The reason is that ADFs sense vibrations and sounds through "lateral lines" on their bodies, and the vibrations produced by internal filters or hang-on-back filters can stress them out. They're deafeningly loud inside the tank. Whatever filter you choose, make sure that the inlet slots or holes are small enough that your frogs' legs won't get sucked into them and trap the frog at the filter inlet. If you're at all in doubt, install an intake sponge over the intake. The sponge will also help biological filtration somewhat and will reduce the need for changing the canister filter media by trapping some of the bigger detritus. You should also use some sort of noise-absorbing padding under your filter, and preferably place it someplace other than on the tank stand. The best vibration-deadening I've come up with is to place the filter on a base of Styrofoam wrapped in Reflectix, which is basically metallized bubble wrap. I just wrap the Styrofoam with Reflectix to form a pad, and set the filter on top of the pad. It works pretty well. Frogs have lungs and breathe air from above the water, so they don't absolutely need aeration in the tank. A standard aquarium air pump and an air stone will help make your frogs healthier and happier, though. There are two reasons for this. The first reason is that most of the "good" bacteria in an aquatic habitat are aerobic, which means that they thrive in an oxygen-rich environment. The "bad" bacteria, on the other hand, are mainly anaerobic, which means that they prefer an oxygen-poor environment. Aerating your tank helps encourage the growth of aerobic bacteria and discourage the growth of anaerobic bacteria. The second reason I like aerating ADF tanks is because the frogs seem to enjoy playing in the bubbles. I guess it makes life less boring for them. One thing that's important to remember is that ADFs are very sensitive to noise and vibration. I know keepers who will not aerate their tanks for that reason: They think the sound of the bubbles will bother the frogs. What I've found, however, is that the bubbles don't bother the frogs at all. It's the hum of the air pump that bothers them. Isolating the air pump by hanging it from a nail in the wall so that no part of it touches the wall (or the tank) solves that problem. Please note that if your tank also has fish, aquatic crustaceans like ghost shrimp or red cherry shrimp, or other animals who breathe through gills, then it must have aeration. Animals who breathe with gills will suffocate and die if the tank is not aerated. Even if you don't plan on using rooted plants, I suggest that you put a few hornwort plants in your tank. They don't need to be rooted or anchored (although they can be). You can just leave them floating. They absorb ammonia and especially nitrates, which will help keep your tank water clean and reduce the need for water changes. Hornwort also grows without any special care and doesn't need special lights. It's basically a beneficial weed. I use it in all my freshwater aquatic habitats. A substrate is just something to cover the glass on the bottom of the tank. The most common and least-expensive substrate is aquarium gravel. If you use a color like bright yellow or red that contrasts with the color of the frogs, it can be very visually attractive. If you plan on planting rooted plants in your habitat, however, then the only substrate I recommend is Flourite. In my opinion, it's the absolute best substrate for rooted aquarium plants. If you do choose to use Flourite, make sure to rinse it thoroughly before installing it in the tank. Just pour it in a big bucket and rinse it out with a garden hose, stirring it up and letting it run over until you've rinsed out as much of the dust as possible. Even then, it will still make your water look like mud if you're not careful when you add the water. I usually lay a plastic trash bag over the Flourite before adding the water, and then remove it very slowly and carefully once the tank is filled. That helps quite a bit. If you do use a substrate, it will mean you need to be careful to vacuum it so little bits of uneaten food and other detritus don't start rotting in the substrate and fouling the tank water. An ordinary aquarium vacuum cleaner makes this an easy chore. I talk more about plants for your African dwarf frog tank here. For now, I just want to mention that having live, rooted plants in your habitat helps maintain the water quality and gives the frogs more places to hide so they feel secure. You can use pretty much any freshwater aquarium plants in a frog habitat, but one of my favorites for an ADF habitat is the Java fern. It's inexpensive, easy to care for, and the frogs like to hide in it. You can also tie hornwort plants to a rock or a suction cup and anchor them on the bottom of the tank, with or without a substrate. They're actually floating plants, so the stems will float up toward the top when they're anchored. This is really more for the keeper's benefit than the frogs'. A night light will enable you to watch your frogs at night. I use a blue LED aquarium night light. Other keepers prefer red. The frogs don't seem to care one way or the other. 4. Sound and vibration dampening. Frogs are very sensitive to vibrations, so a layer of something between the tank and the stand to dampen vibrations from people walking in the room, the hum of electrical equipment, and so forth is a nice touch. I happen to use Reflectix, which is metallized bubble wrap. It works pretty well. Styrofoam, carpet padding, or carpet remnants also work.